The Green Team wants to hear from you! Renewable Energy Counter! Click here if you've signed up! The MUMC Green Team invites you to stop into the Church and pick up a complimentary Go Green Bag! It includes information about the importance of renewable energy and how to enroll in a renewable energy program, plus a free energy efficient light bulb! Have you enrolled? Click on the Green House, to add your count to our total! Our grant committee would love to know the impact of this program! 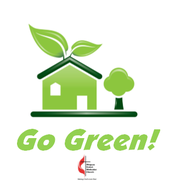 Download our Go Green Brochure here and read it when you have time. Contact MUMC for more information on how you can Go Green! The goal of the Green Team is to share information and ideas ​with the congregation and the community that will impact our environment in a positive light. Roadside clean up along a Mequon Roadway near Katherine Kearney Carpenter Park. Articles printed in the Spire to share ideas and information to help save the earth. We have an agreement with a local Boy Scout Troop to accomplish "green" projects around the church and parsonage. Our community gardens have opened! Garden plots are be available for people to grow healthy, inexpensive food for themselves and their families as well as foster a sense of community among its gardeners. ​Click on the link below for more information. We are the MUMC Green Team and we invite you to Go Green! "Going Green" is not simply doing one or two things differently to conserve natural resources or the environment. For many of us it is a dramatic change in our attitude regarding our precious planet and a significant change in our life-style. ​Click on the link below for more information about renewable energy​ options.